Central to all types of “fun in the sun”, Peoria, Arizona captures every facet of excitement on the spectrum of adventure. Ranging from outdoor excursions to dramatic entertainment, this Phoenix suburb boasts a variety of experiences for all to enjoy. Whether you are an individual craving extensive hikes and high energy activities or you are a more relaxed soul who wants to enjoy all of the arts and indulge in the vibrant culture, Peoria attracts only the most exhilarating people. With a deep commitment to providing a high-standard of living and promoting economic growth, it is obvious why Peoria was ranked as the 7th best city to live in on a list of “America’s 50 Best Cities”. Devoted to maintaining top expectations for the quality of life of its residents, Peoria authorities also focus on preserving its top-rated education system as well as upholding its charming character. Close to Cardinal Stadium, you can find Westgate which is home to a plethora of dining options and areas to walk around, see the sights and enjoy time with good company. This area features the Tanger Outlets, an outdoor outlet mall, for all of your shopping needs! Still have the retail bug? The Arrowhead Mall is just a quick trip away! At the epicenter of attractions, Peoria proudly sits as a convenient location between several significant geographical wonders and urban landmarks with direct access to two major roads that allow for easy access to a variety of different areas. Sports fanatics, music enthusiasts, adventure seekers and the like will each find something to their taste in Peoria. Explore the city to find the Arizona Broadway Theatre in Peoria 83 (P83) Entertainment District and catch a show at this professional, fine-dining theater. More into the athletic side of things? Within just 10 miles of Peoria, there are four spring training sites that are home to the San Diego Padres and the Seattle Mariners where you can easily catch a Cactus League Spring Training game. Would you rather get out and see the sights or explore nature? Situated within reasonable commutable distances, national landmarks (such as the Grand Canyon and the cool pine forests of northern Arizona) are right at your fingertips. Whatever you choose, you are sure to find plenty of options to your liking! Aspen Square Management is committed to making you feel at home from the day you step through our door. We truly believe coming home should be the best part of your day! With all that Peoria has to offer you, we insist on maintaining the high standard and offering the perfect home at a reasonable price. We offer two-story townhomes and apartments in Peoria, at Rancho Del Sol. It is a community dedicated to exceeding all of your expectations and fulfilling all of your needs. Our floor plans offer spacious two bedroom, three bedroom and four bedroom townhomes with fully equipped kitchens and ample dining space. 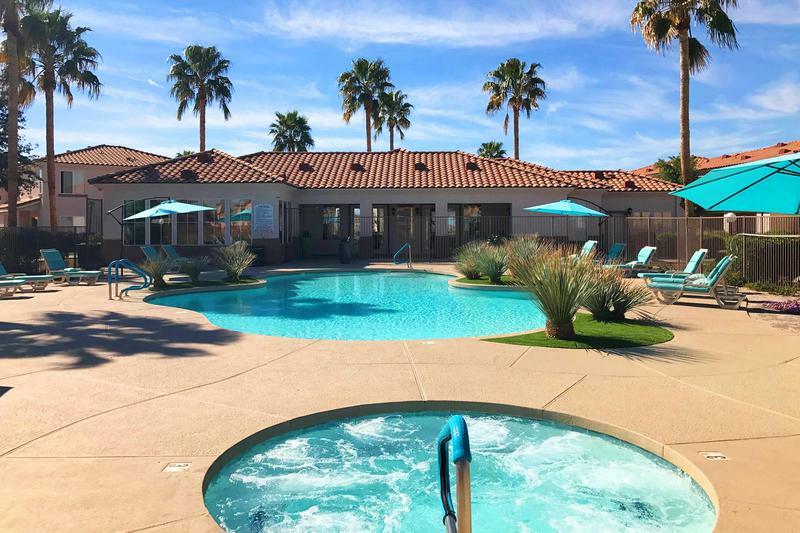 These beautiful Peoria, AZ apartments for rent have expansive closet space and washer/dryer appliances available in the apartment homes for your use. Furthermore, depending upon your select floor plan, you will have the opportunity to enjoy two and a half or three and a half bathrooms. Everyone is welcome at Rancho Del Sol, because we’re pet-friendly, accepting breeds large and small. But the unparalleled living doesn’t stop there because just outside of your door, you will have access to resort-style pool and jacuzzi, a fully-equipped fitness center and covered parking for every resident! We also offer a playground for the kids on site, and there is a park right across the street from our community. Additionally, the convenience continues as the school bus stop for your children pick-up and drop-off on the property. Make coming home the best part of your day when you live at Rancho Del Sol. Talk to our staff today and learn more about our apartments in Peoria, Arizona.